In his belated address to the nation on the debatable economic measures ushered in by him or ordained by the bossy Sonia, Prime Minister Manmohan Singh usurped the 1991 economic reforms that were in deed fathered by PV Narasimha Rao. 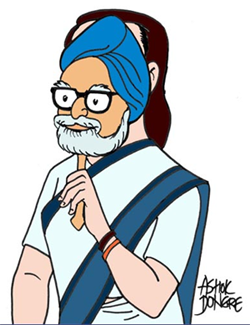 And to the observant Indians, that was true to Manmohan Singh’s character. Consider this: But for PV Narasimha Rao, who fostered him, Manmohan by now would have been a forgotten ex-governor of the Reserve Bank of India, one among many before him. What a decent man’s morality would demand when his patron saint falls on bad times? Maybe, to leave the sinking boat is fine for a careerist politician but desertion wouldn’t be the in thing for the decent minded, would it be? But what the wily Manmohan did? When his mentor was in the political dumps, he had visualized greener pastures for himself in the shade of Sonia’s Bofor’s tainted pallu. It called for no political genius to foresee that the NDA and UPA political dispensations would have alternate reigns on the musical chair of the Delhi kursee and that when the latter’s turn comes; Sonia’s ‘foreign origin handicap’ would force her to concede the prized seat to someone else from her party ranks. So what our cunning doctor did? Not only he ingratiated himself to her but publicly declared that he’s not a “prime ministerial material” in that Prannoy Roy interview, not once but twice that was in case Sonia’s ears failed to catch that in the first instance. Poor Pranabda paid not once but twice for his conviction that he is endowed with prime ministerial calibre. What to make out of all that? If he was secretly coveting the gaddi while publicly averring that he was not up to the mark, then he is cunningly self-serving. And if he genuinely believed that he is not a “prime ministerial material” and still had taken up the job, then he is morally dishonest. Either way, he’s not a man of intellectual integrity and the country is paying the price for having him at the helm of affairs. Maybe, he does not covet money for himself but he serves Sonia’s covetous cause. Juxtapose the film actress turned politician Jayaprada, who stood by her mentor Amar Singh when he fell foul with Mulayam Singh and was on the verge of oblivion. Well, character is all about the morality of the mind, isn’t it? The moral standard of the oldest profession is altogether different!